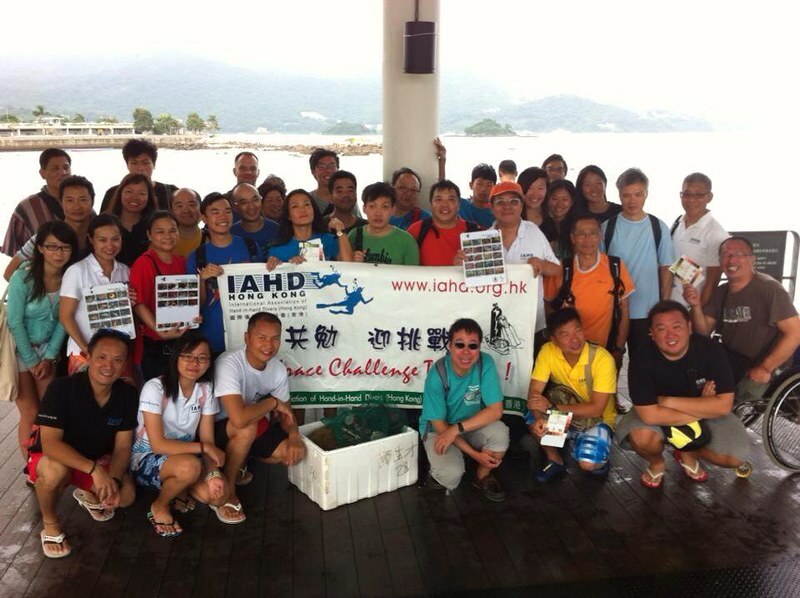 Last Saturday it was time to support another session of diving with the International Association of Hand in Hand divers Hong Kong. An enthusiastic group of divers that goes out exploring the waters of Hong Kong a few times a year. The interesting thing about the group is that a number of people in the group have some sort of a handicap. Whether this is visual, or physical they do come out to have a good time underwater - fully inline with IAHD motto “Embrace Challenge Together”. This trip had a conservation team, the guys signed up to participate in a reef check organised by the Agriculture, Fisheries and Conservation Department of Hong Kong Government. A full fledged survey where designated areas get checked for the quantity and quality of corals, vertebrates and other underwater life. The area underwater gets "boxed" in, and teams will monitor the for them important things. Whether it is fish, corals or other underwater life. After the day, data gets submitted and will be centrally processed by the AFCD people so they can keep an eye on what is going on. On the monitoring side, certain teams also did a Coral Watch session. Using a few provided tools, coral watch does allow a health check of corals. It uses a colour chart to compare the darkest and lightest colours of particular corals in order to determine the impact of coral bleaching. After the day the data gets submitted on the coral watch website so they can keep a global eye on what is happening to reefs. I did change the objective of the first dive a little. Some of the people I was diving with had not been in the water for a few months, and did need a little time to be properly buoyant under water again. Especially as the area we were diving was a little challenging as there was surge, it was shallow and the visibility was crap. The second dive of the day had as theme "Dive against Debris", a project AWARE support initiative to clear our seas from rubbish. It is also a global initiative where dive teams all over the world gear up to remove the rubbish. The guys that were diving with me and myself picked up a teapot, lots of fishing line, some cans and other fishing related objects. It always surprises me the amount of rubbish we come across at spots that are frequented by (diving)boats. All together a very rewarding day!